As a child, I absolutely LOVED puzzles and even (at some point) had a giant puzzle board with my name painted on it that we would slide under the bed because it was the only place it fit. Ah, the memories! 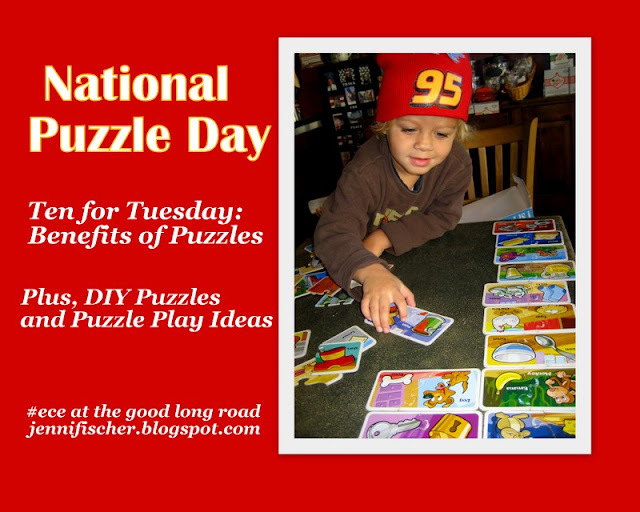 Well, I recently discovered that today, Jan. 29th is National Puzzle Day, so I pushed back (AGAIN!!) the resumption of my Ten for Tuesday: Things That Go! 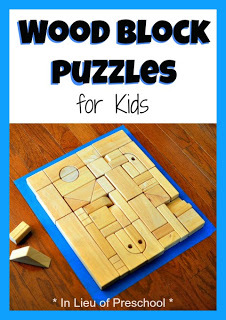 Series to give you 10 (or more) educational benefits of puzzles for kids (with an emphasis on Early Childhood Education, since my kiddos are little) -- plus, I am sharing some great great DIY puzzles and fun puzzle activities as well. Enjoy and get puzzled! 1. Problem Solving is a basic (and very important) skill that children gain from doing puzzles as they ask themselves: Will it fit? and assert which puzzle piece goes where. This type of problem solving is clearly in action with this great DIY Wood Block Puzzle from In Lieu of Preschool. 2. Spatial Recognition/Shape Matching - Puzzles also encourage kids to engage in spatial recognition and matching as they notice straight edges and see how a puzzle piece shape matches to an empty space in the puzzle. A great variation on this is to make your own puzzle/matching game using items you already have on hand like this one from Happy Hooligans, which provides entertainment and learning opportunities for 2-4 year-olds. 3. Early Math - Puzzles introduce children to math concepts, such as early geometry and spatial awareness in a way that is inviting and fun. Tangrams are the perfect puzzles for this type of learning, and I recently stumbled upon some brilliant DIY Magnetic Tangrams made from Paint Chips when Delicate Construction featured the tangrams that School Time Snippets made. 4. Learning Geography! Puzzles are also a great way to learn geography. Geo-Puzzles work extremely well for this and Mama Smiles shares these as some of her favorite educational toys. Since Wild Thing loves both puzzles and maps, I have to get some of these! 5. Early Literacy - Puzzles are a fun way to engage children in early literacy as they put together the puzzle of a word, such as their own name like these Name Puzzles from Teach Preschool. 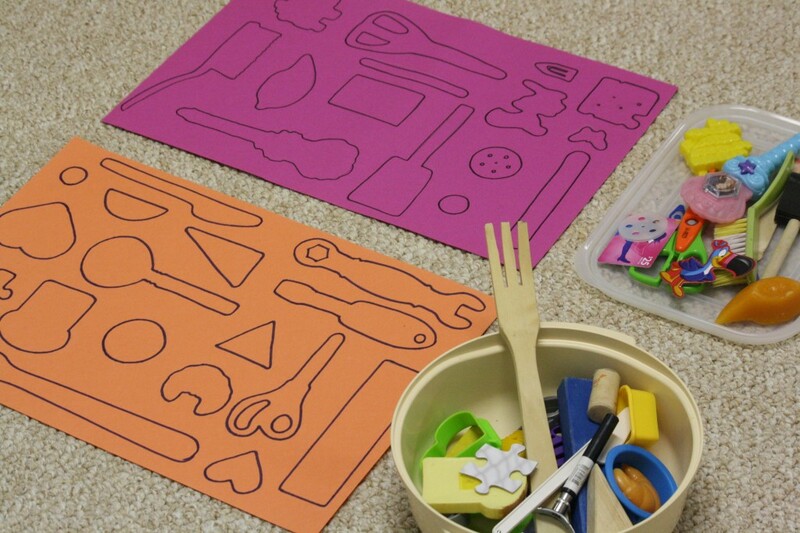 Plus, Letter Puzzles, like the ones from Storytime Katie, can help children identify beginning letter sounds. 6. Vocabulary Building - Wild Thing loved doing the simple matching puzzle (shown in the very top photo) that our favorite coffee shop happens to have in their kids section. The puzzle consists of several two-piece matching puzzles such as Lock-Key, Child-Mom, Hat-Mittens and he began doing it at age 2, and I noticed that the puzzle really helped him build his vocabulary and oral skills (in addition to all the other benefits, fine motor, hand-eye, etc.) I would love to make a magnetic version of this puzzle. See how simple it is to Make your own Magnetic Puzzle at My Kind of Makeover. 7. Critical Thinking + Observation Skills - These two go hand-in-hand as completing puzzles requires children to hone their observation skills as they assess the original puzzle and then implore their critical thinking skills to complete the act of putting pieces together to recreate the original image. 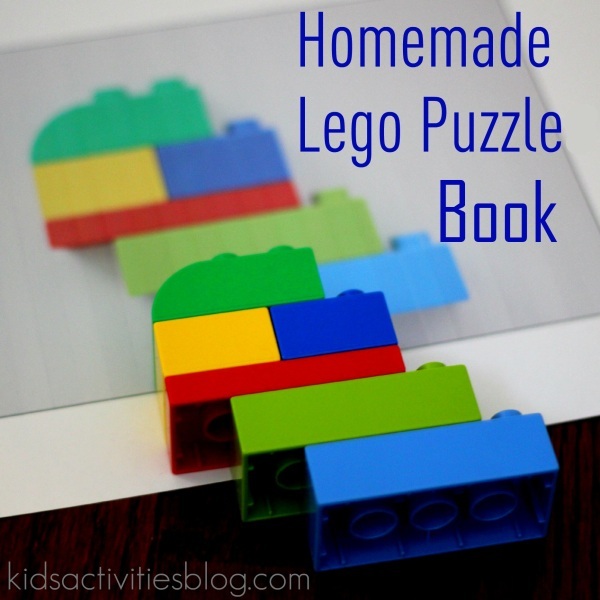 The DIY Lego Puzzles Kristina of Toddler Approved shared at Kids Activities Blog are a perfect example of these two skills coming together in the world of puzzles. 8. Fine Motor Skills + Hand-Eye Coordination - These two also go hand-in-hand (in my mind) with puzzles and speak to the benefit of introducing simple puzzles very early on as they can be great for babies who are starting to be able to have some basic control of their fine motor skills and are ready to challenge their hand-eye coordination. Wild Thing was not quite 1 when he got his first puzzle. 9. Patience and Diligence - As children work through trial and error and take the time to assess their mistakes and improve their ability to complete a puzzle, they are learning to practice patience and to be diligent when taking on a new or challenging task. 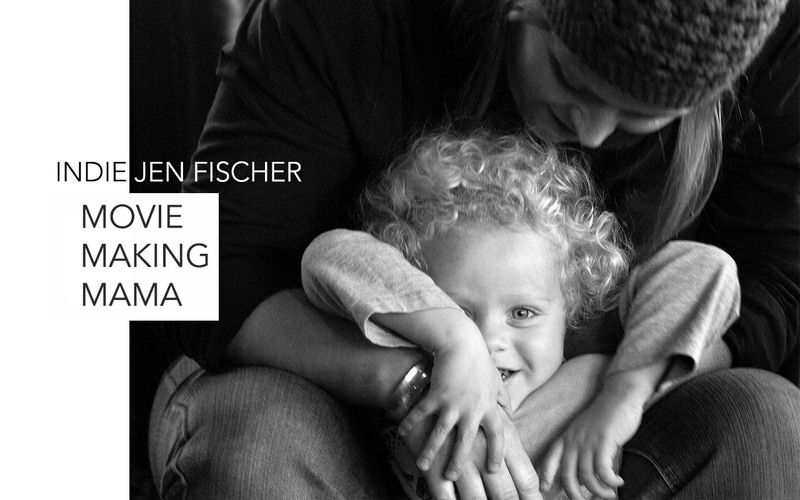 An important thing for us to remember as parents is not to rush in and help (i.e. put pieces in for them) too much and too early. It is important to give the child time to figure out the puzzle and complete it on their own, as much as possible. 10. Memory - Wild Thing loves doing the same puzzles over and over again and of course, eventually, they become less and less challenging, but are still fun. The repetition process in completing the same puzzles over and over helps improve his memory and bolsters his confidence. Yes - I will say it again, I love puzzles! 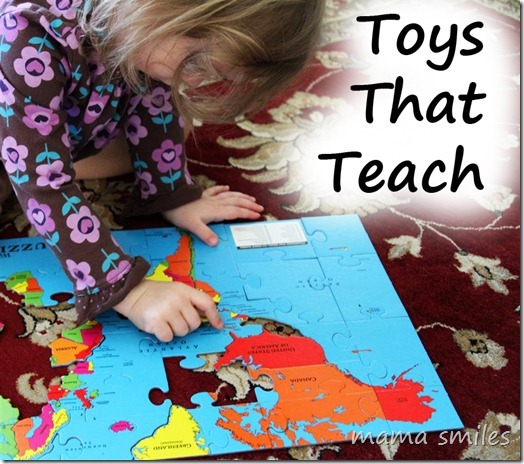 Bonus Benefit: Gross Motor Skills + Movement, particularly when using large puzzles -- this benefit was brought to my attention through this great post about Jigsaw Puzzles with Toddlers from Triple T Mum. Before I wrap this up, I have to share two other great puzzle resources I discovered as I was putting the finishing touches on this post: Teach Preschool has a great Puzzles Pinboard, and on it I saw this great post from B. Inspired Mama: 9 Benefits of Wooden Puzzles from B.Inspired Mama, featuring a guest post from Puzzled. Something I would like to improve in our house is the accessibility of the puzzles with them on child-accessible shelves, rather than in a drawer (as they are now). This is part of a larger effort I am engaged in that includes bringing Montessori concepts into our home. It has worked well in the kitchen with an accessible shelf for Wild Thing to get his own cereal and pour his own milk. The balance involves also keeping the house safe for Caterpillar (18 months old). P.S. Our favorite puzzles are the Melissa and Doug Wooden Puzzles and the 24-piece Thomas the Train puzzles we have been so lucky as to find at our local dollar store. What puzzles do you love? I shared this post at: Tuesday Tots, Mom's Library Link-Up, It's Playtime! After-School Link-Up and Montessori Monday. I love all these DIY puzzles you've shared! Our favorites at the moment are the Melissa & Doug pattern block puzzles. I always say I'm going to make some books for my kids, but I've never done it yet. I love when they are old enough to start doing puzzles! The list of benefits is great, too. We don't always realize that simple activities have so much value to them! I love this especially tracing the shapes and matching. The kids could trace them too :) Thanks for linking up. The post I linked this week has two puzzles! We love the wooden duck puzzle that was a gift.